Joseph Comerford, Marquis d’Anglure, is one of the most enigmatic members of the family. His origins and place in the family tree have been obscured by his own obfuscation: the family tree he registered in Dublin was self-serving and vainglorious exercise, aimed at asserting a nobility that would underpin the French aristocratic title he acquired when he bought a chateau and petit domain in Champagne; while the plaques he erected in the Comerford chapel in Saint Mary’s Parish Church, Callan, Co Kilkenny, and the Comberford Chapel in Saint Editha’s Parish Church in Tamworth, were proud but vain efforts to link the Comerford family in Co Kilkenny with the Comberford family in the Lichfield and Tamworth area of Staffordshire. Although he claimed on those monuments that his family had been brought low by the ravages of civil wars in Ireland and in England, he appears to have remained in Ireland for some years after the defeat of the Jacobite cause in the 1690s without any obvious social, political or financial disadvantage. And while he eagerly craved acceptance in French aristocratic circles, the title he acquired has never continued in use in the Comerford family. Joseph Comerford’s pedigree, registered with the Ulster Office of Arms, the principal heraldic and genealogical office in Ireland, makes extravagantly fanciful and romantic claims for his origins and ancestry. Yet, paradoxically, it is difficult to disentangle truth from fiction, or to be quite certain about Joseph Comerford’s family origins. However, we can presume that Joseph Comerford knew and was honest about the names of his parents and grandparents. It would appear, therefore, that his grandfather was Peter Comerford, who married Honor Everard, and that his father was Edward Comerford, a merchant, of Clonmel, Co Tipperary. Edward is named in the Betham abstracts as a nephew of M... Everard. Edward married Barbara Browne; he died in November or December 1679, and his wife Barbara died in 1719. ● 1, Joseph Comerford, the subject of this profile. ● 2, (Captain) Bonaventure Comerford, a captain in the Regiment de Dillon in France. He was taken prisoner at the Battle of Malplaquet. He died in 1709 without having any children, and is buried in the Church of Saint-Pierre in Douai. ● 3, (Captain) Luke Comerford. ● 7, Catherine, married James Nagle of Garranvilly or Garnavilla, near Cahir, Co Tippeary (d. ca 1709-1710). He was Serjeant-at-Arms in the Irish House of Commons, and his brother, Sir Richard Nagle, was Speaker. They had 10 children, including some with Comerford names: Joseph, Catherine and Bonaventure. Joseph Comerford, the eldest son of Edward Comerford of Clonmel, was sworn a freeman of the City of Waterford, 10 December 1686. He subsequently was commissioned a captain in the Earl of Tyrone’s regiment of foot, a Waterford regiment in the army of James II. However, despite the terms of the Treaty of Limerick following the defeat of the Jacobite cause, Joseph Comerford was still living in Ireland in 1692. In that year, he bought the “Ikerrin Crown,” an encased gold cap or crown weighing about 5 oz, which was discovered 10 ft underground at the Devil’s Bit, Co Tipperary by turf-cutters, and he saved it from being melted down. Soon after, Joseph moved to France, and as Joseph de Comerford of Clonmel, he received letters of naturalisation in France in January 1711. 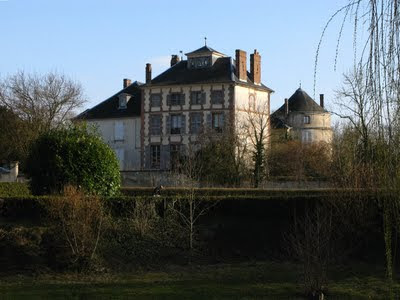 In exile in France, he was made a Chevalier of St Louis, bought the Anglure estate on the banks of the River Aule in Champagne, including Château d’Anglure, and claimed the title of Marquis d’Anglure. [See Comerford ] Joseph Comerford may be the Baron d’Enguemore who appears in Reitstrap’s Armorial. However, he returned to Ireland at the beginning of the 18th century, when he was living in Cork, and he moved to Dublin in or before April 1724, when he registered a fanciful family pedigree at the Ulster Office of Arms in Dublin Castle. At this time, or soon after, Joseph Comerford probably erected the monument to Thomas Comerford, in Saint Mary’s Church, Callan, Co Killenny, and the plaque in the Comberford Chapel in Tamworth, Staffordshire, which was erected in 1725.
and afterwards his wife Le[titia Shee] got this [mon]ument erected. yet this flower does not renew its beauty by vernal shower. England, the cradle of his race, gave him an illustrious name. The fame of a house never yet closed still flourishes. This renaissance monument on the east gable of Callan Church is about 5 ft above the ground. The letters are in raised Roman capitals, and on either side there is a representation of a rose bush in flower. A slab inscribed Ostium monumenti marks the entrance to the vault beneath. The coat-of-arms is that of the Comberford family of Comberford rather than that of the Comerfords of Co Kilkenny, and impales those of Shee, with three mottoes: Virtus Venusta (above the Comberford crest), Vincit Veritas (a Shee motto, above the Shee crest), and So hov hoo den (below the shield). It may be that an original monument was replaced by Joseph Comerford in the 1720s. Although Crotty argues that this may be the original monument, the existence of the earlier monument described by Carrigan, the mistaken date 1629 rather than 1627, the similarity to the Comberford monument in Tamworth, and the use of the Comberford arms point to Joseph Comerford as the principal figure responsible for its design and erection. Shaw said that above this plaque there was a representation of the Comberford coat-of-arms impaling those of Bates of Sutton, with the Comberford crest of a ducal coronet and peacock’s head, but this has long since disappeared. The monument was probably erected in 1725 by Joseph Comerford a year after registering a pedigree in Dublin claiming descent from the Comberfords of Comberford for the Comerfords of Kilkenny. Comerford had already used the quartered the Comberford and the Parles arms as his own, placing them on a Comerford monument in Callan, Co Kilkenny. It is difficult to imagine how – if Robert Comberford was the last of the line and died in 1671 during the reign of Charles II – a branch of the family could later follow James II to Ireland and then into exile into France. The tablet in the Comberford Chapel contains a number of other inaccuracies: at the time of Robert’s death in 1671, the Comberford family had been living in Staffordshire for no more than six rather than seven centuries; Robert’s death did not bring about the extinction of the Comberford line in England; the Comberfords of Comberford were not related to Joseph Comerford or to the Comerfords of Ireland, who were descended from the from the Quemerford family with origins in Quemerford in Wiltshire; and Mary Giffard and Anne Brooke are more likely to have been buried with their husbands than with their parents in Tamworth. Nor did the Comberford family die out with the death of Robert Comberford. When he died, Robert had no sons, but while the Comberford name was continued in the Brooke family through his grandson, Comberford Brooke, the male representation of the Comberford line passed to his distant cousin, Francis Comberford of Bradley, who sued unsuccessfully for the estate. 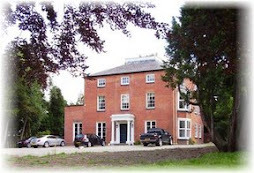 Comberford Hall continued to be lived in by Robert Comberford’s widow, Catherine, their daughter, Anne Brooke, her son, Comberford Brooke, and his children, perhaps as tenants of the Skeffington family, until at least 1718. 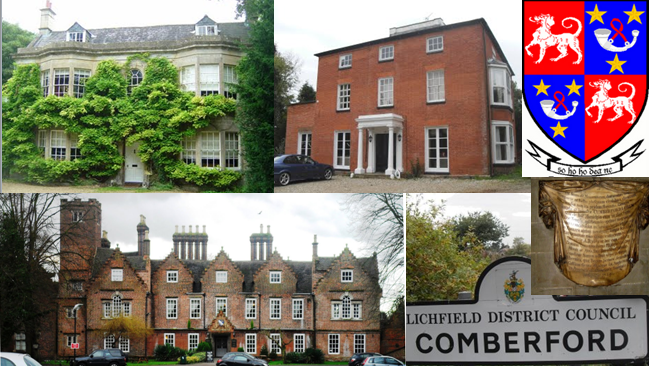 Undoubtedly, the family was crippled by debts and mortgages, and Comberford Hall eventually passed to Robert Comberford’s cousin and neighbour, Sir John Skeffington, Viscount Masserene and Baron of Loughneagh, a royalist who had actively supported the restoration of Charles II [see Comberford 8, ]. Joseph Comerford returned to France after registering his pretentious pedigree and erecting plaques in Callan and Tamworth that may have been intended to support and substantiate his genealogical claims. 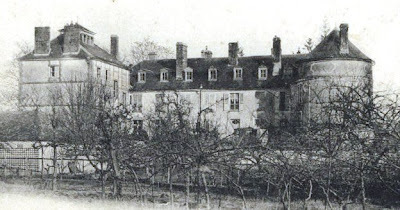 On 28 November 1725, as Joseph de Comerford, he gave the Anglure estate, including “the grounds and seigniories of Mesnil and Granges,” 3 km west of Anglure, to his nephew, Louis Luc de Comerford. When he died in 1729, Joseph Comerford’s will was proved in Paris. Another will was dated 19 May 1729 and went to probate in Dublin that year. He was buried in the chapel at Château d’Anglure not under the title of Marquis d’Anglure but as Baron d’Anglure et Dangermore. Joseph Comerford had married Margaret Browne and they had an only daughter, Jane Barbara. But there was no male heir to inherit his claims and titles. Instead, he had designated his brother Captain Luc (Luke) Comerford as his heir. In default of male heirs, Joseph Comerford settled his estates in Champagne on the heirs male of his brother, Captain Luke Comerford, and in default of such heirs male on his kinsman, Major-General John Comerford, and his male issue. Captain Louis-Luc Comerford of Sézanne, north of Anglure, became Seigneur d’Anglure as heir to his uncle Joseph. He appears to have sold the Anglure title and estate in the mid-18th century. According to an advertisement dated 12 June 1752, a quarter of a century after Joseph Comerford’s death, Anglure was associated with the title of a barony from “time out of memory” and with the title of Marquis d’Anglure which was created in 1657. A ruined Louis-Luc de Comerford sold his estates, including Anglure, Mesnil and Granges-sur-Aube, and Belle-Assise, to Jean de Cabanel and retired to Sézanne, north of Anglure, where he lived in extreme poverty. After the death of Louis-Luc Comerford, his next brother, Captain Pierre-Edouard Comerford, used the title of Baron Dangermore, but he made no pretensions to the Anglure titles. This branch of the Comerford family survived into the early 19th century, but died out in 1813 with the death of Captain Joseph-Alexandre-Antoine Comerford (1757-1813). Since then they have never been assumed or claimed by any member of the family. The destiny of Joseph Comerford’s crown, title, chateau, and his many pretentious claims are interesting chapters in the story of the decline of a family. Burtchaell’s pencilled notes on Joseph Comerford’s Pedigree, GO Ms 160, f. 104; Basil O’Connell, “The Nagles of Garnavilla”, The Irish Genealogist, vol 3, no 1 (January 1956), p. 20; Hayes 1, p. 654. Geoffrey Keating, The General History of Ireland (1732), p. v; The Dublin Penny Journal, vol. 1, no. 9 (25 August 1832); John Cornelius O’Callaghan, History of the Irish Brigades in the Service of France (Glasgow, 1870), p. 275. Keating (1732), p. vi; JC O’Callaghan, p. 275. Carrigan 3, p. 303; JAPMD 2 pp 147-148, where it is described as “This once elegant but now sadly damaged monument.” Photographed and transcribed by Patrick Comerford, 05.06.2011. Transcribed and photographed by Patrick Comerford, 22.3.2007; see Shaw 1, p. 428, where it is transcribed with errors; Adams, pp 13-14; and Stone, p. 60, plate 67. Keating (1732), p. vi; Burtchaell’s pencilled notes, loc cit, f. 104. © Patrick Comerford 2009, 2011, 2012, 2013. Last updated 23 and 25 November 2009; 18 May 2011, 21 July 2011; 9 May 2012; 14 April 2013.